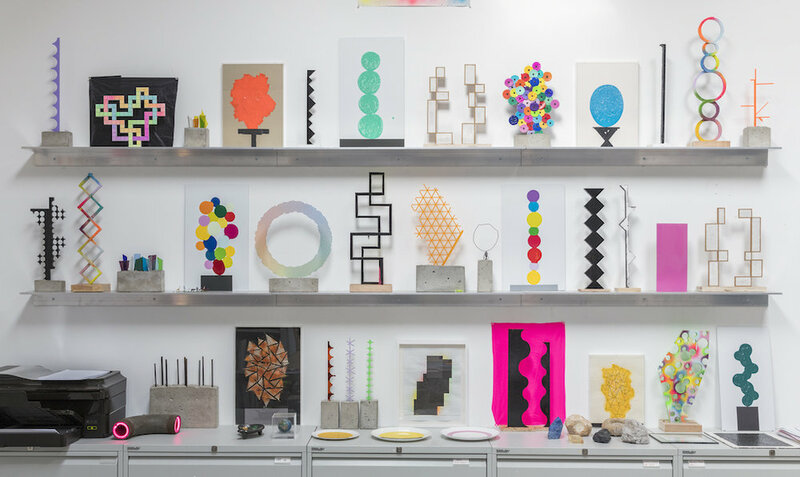 The first one-person exhibition in Australia of work by the London-based artist David Batchelor. 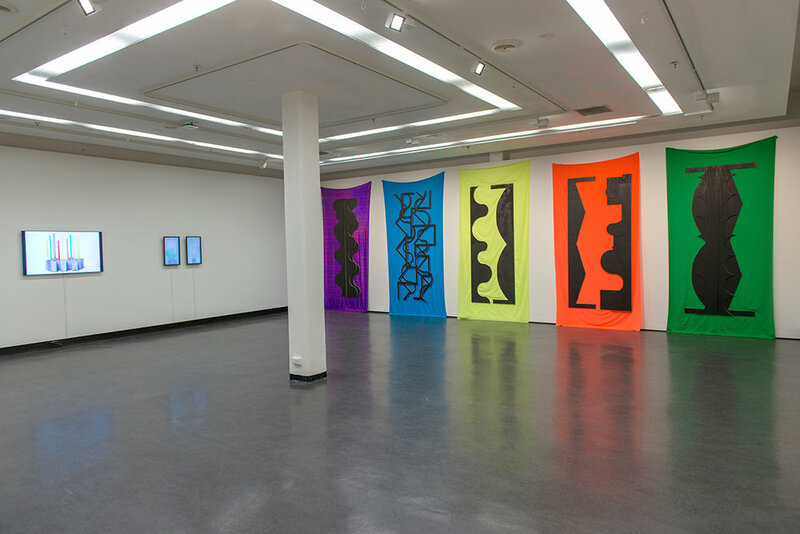 For the past twenty five years, Batchelor has been exploring the strange complexities of colour in works that encompass sculpture, installation, painting, drawing, photography and animation. He has also published a number of books and essays on colour, including Chromophobia (2000). In this exhibition Batchelor will show over one hundred drawings, together with photographs, some new animations, and a group of sculptures made during his visit to Melbourne. I first became aware of David Batchelor’s work in the 1990s when I saw reproductions of I Love King’s Cross and King’s Cross Loves Me. In this work acrylic monochromes are attached to 16 dollies that sit in a row (some are stacked) on the floor. It appealed to me for its use of colour, for its implied sense of pictorial mobility and for its mobility of content. At the time, due to its planarity, I read this work as an extension of ‘abstract’ painting as much as an extension of readymade sculpture into time and space. It seemed to pictorialize the space. I imagined how the colours, lights and images reflected onto and from the glossy surfaces of the dollies and how this would change as the viewer perceived the work from different positions. The work is a celebration of movement and provisionality—of the elusiveness of colour and our perception of it. I was primed to see a work like this in the 1990s as I saw in it some of my own interests at the time, albeit in a succinct and different way. In some ways this is the beauty of all object-based art: the works will wait for us until we are ready to experience them and extend our understanding. We grow from what we know. To my mind then and now, I Love King’s Cross and King’s Cross Loves Me moves beyond the typical grunge post-minimal and post-formal aesthetic currents of the time. It moves beyond irony, yet still retains humour and inventiveness. It operates authentically—by this I mean it is itself. Its forms deliver a complex range of experiences. It means certain things, not just anything. I still love I Love King’s Cross and King’s Cross Loves Me for its simplicity, astute complexity and humour. I still love I Love Kings Cross Kings Cross Loves Me for its materiality; for its particular colour palette; for how colour over time becomes light; for how the work locates itself in the site; and for how site gets located in the work through reflection. I still love the title, which—in combination with its materiality—suggests not only the grittiness and hardness of that suburb of London, but also feeling. How does Batchelor phrase it in a title of an exhibition? Shiny Dirty. The work acknowledges the presence of the self in place, and also the presence of place in ourselves. It seems a very personal work. I Love King’s Cross and King’s Cross Loves Me recognizes the world we live in… how we have affection for the places we inhabit despite, or because of, their imperfections. This work generates a range of readings that belie its material simplicity and, in doing so, demonstrates a particular individual intelligence, sensibility and imagination at work. I also like this work for it introduced me to the work of David Batchelor. 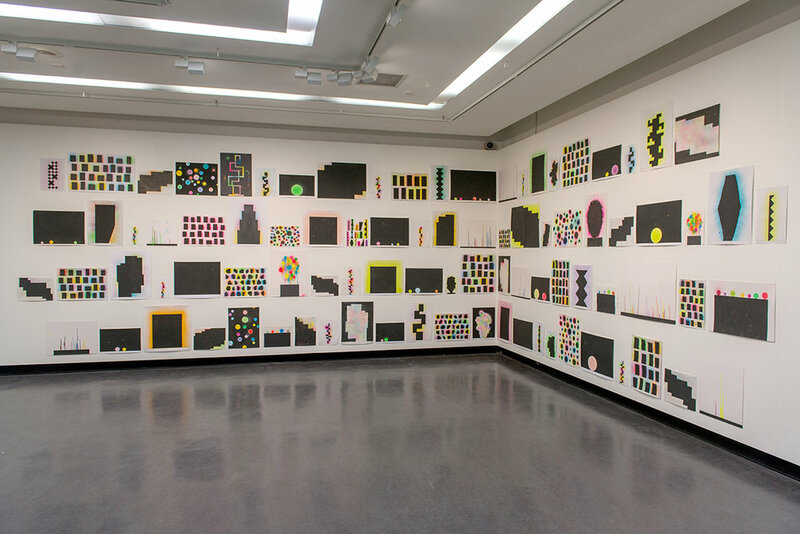 Since that time, I have seen and experienced the work of David Batchelor in various exhibitions and studios. Batchelor has done much to assist our understanding of colour through his work and writings. He asks that we consider this thing called colour… if it can be called a thing. I think of it more as an event, an experience in time. He asks us to consider how we look at colour. He asks: What are the qualities of colour in the contemporary world? How can these be put to use to create art? How do natural and artificial light and colour interact? What do these colours enable us to feel… to think? How does the specificity of each work generate differing affects and readings of colour? 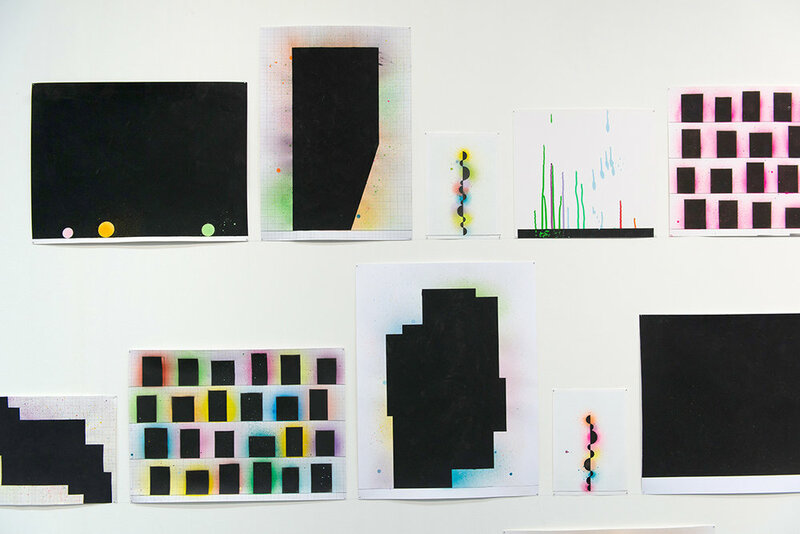 David Batchelor’s work offers readings beyond his engagement with colour, beyond the pictorial and the formal. His work offers us unique opportunities to engage with what it means to play, to improvise, to test. It demonstrates an inquisitive mind and sensibility at work in the contemporary world. Through what appears to be his limited concerns with colour and materiality, he opens up a range of diverse issues for consideration: questions related to the social, the political and the cultural. Fundamentally I believe his work is engaged with how we ascribe value and how art exists as a complexity amid complexity. He re-values materials. It is not just that he chooses non-art or industrial materials to make art with, it is HOW he employs them. He engages with them not as an industrial worker might, but as an artist—analysing their properties in order to generate readings and experiences. I think here of how Batchelor chooses a particular brand of commercial enamel paint for its specific colour properties, viscosity and drying qualities to create paintings like Colour Chart 38 (orange) 04.08.11. To make the work, Batchelor carefully poured paint onto Dibond, turning it to create a specific form. He realised that in its drying process the paint would form a crinkled skin that manifests its own duration of becoming. The work reveals its own history of being. It exists as a flat sculpture, a pictorial image and as a signifier of time. This temporal element in Batchelor’s work—its speed or slowness—has often been overlooked. To my mind Batchelor’s work offers us an opportunity to consider time as much as colour and matter. Batchelor re-values colour. Unlike the more conventional interrogations of colour, which often stop at representational or symbolic understanding, Batchelor presents us with colour as fact… with colour as pigment, as light, as sensation… as energy. Batchelor’s choice of colour is specific. Informed by the surrounding fabric of the everyday urban world, these are high intensity unmixed synthetic colours manifest as pigment or light. The colour/light often seems thin or embodied as plastic or projections, evoking the speed and the artificiality of the light of the contemporary city. But yet his work is not simply referential/representational; it is what it is—artwork that manifests colour-energy situated amid bigger complexities. That, in turn, energizes me and makes me think. As perceiving beings we receive colour. Colour does not exist alone; it is always in something or on something, and it enters us through the twin filters of perception and knowledge. Through Batchelor’s work we have the phenomenological experience of colour; that is, colour perceived via its material presence as sensation. But through it we are also able to consider how colour functions in our culture today. Batchelor’s works operate physically in front of us and act as repositories of all the cultural baggage we carry with us concerning our understandings colour and our historical habits of looking. Batchelor’s work plays with this. Colour is mediated through size, scale, materiality, process and context, and it is transmitted through structure, contrast, drawing and geometry. We see light and colour over time from our inside out… our inside is affected by body and mind, our mind informed by both cultural and felt constructions. These constructions, ideas and beliefs are not fixed, even though many wish they were. They move over time in a similar way to our own perceiving… all are shifting. Just stare at a colour for a minute; our perception of what is occurring shifts. There is, if you like, a movement of meaning, of content, of recognition over time. Colour is nuanced and never stable. A monochrome can only be seen through contrast by what surrounds it… it is never alone. A monochrome is an impossibility. Colour theory is just that: theory, operating in the realm of the cerebral, ideas and concepts. Colour experience—in the city, in the world or in our mind—is just that: experience, with all its complexity. Coloured light operates differently from pigment. Illumination/projection works differently from the reflected light of paint. How we are presented with colour creates particular sensations and readings. Batchelor explores these issues with an openness and with an understanding of how the specificity of the artwork’s materiality mediates and generates readings. Colour in Batchelor’s work operates as sensation, as proposition, as question and as enquiry. 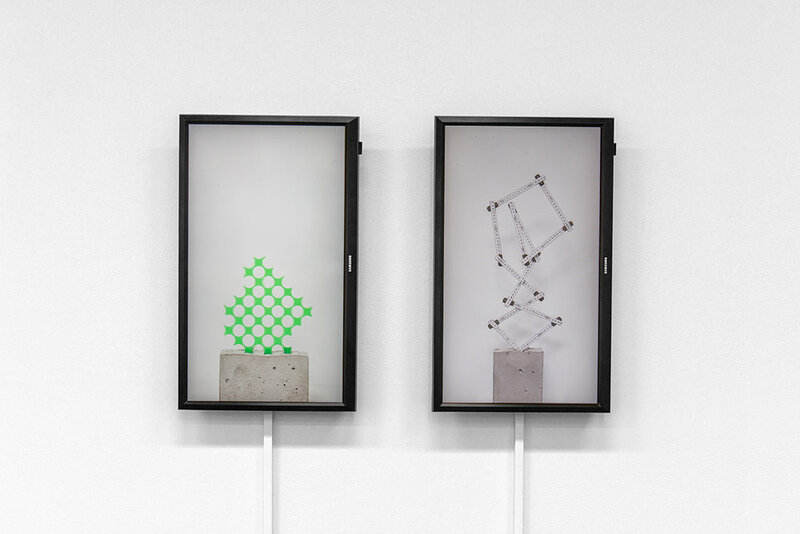 In his exhibition Pyschogeometry 2 at RMIT University’s SITE EIGHT gallery, Batchelor engages us with colour and light via different media and materials: light, plastic, paint, concrete, wood, fabric, paper, tape, video. Key works in the exhibition demonstrate his flexibility of practice. They include silhouette sculptures/installations, animated videos and a major suite of drawings/works on paper. They reveal that Batchelor’s art is also about process… about doing. It is about the specificity of how things are MADE and how, in turn, this creates readings and experience. Batchelor has made some rules (mostly adhered to). For example, he does not use a brush nor does he mix paint, choosing the paint chart, virtual or actual over the painter’s palette. When he does employ paint (as discussed above), it is as a viscous flowing drying substance that retains its readings as a commercial material. In his works on paper—by employing non-art, commercial aerosol sprays, industrial tapes, markers and papers—Batchelor emphasizes that his works are made of “stuff” extracted from the surrounding everyday urban world. The colour and materials that constitute his work may reflect the “beauty” of the hardware store and not the artist supply shop, BUT the material outcomes of his practice will never remain in the hardware store. They become artworks offering us the opportunity to consider what Art engages us with: the felt, the constructed, the awareness of time, of accident, of paradox and of complexity. The artworks are composites where things different in kind (feelings, style, materials, memory) are reconciled over the time of viewing and in the duration of the viewers’ experience and memory (a nod to Bergson here). To me the strength of Batchelor’s work is that it links us both to the world and to art. His work is not about the ideal, the pure or the perfect; it is about what works… what is appropriate to his needs as an artist at the time. His colour is intense but not pure. His works do not illustrate pre-ordained theories but manifest experiences and ideas. They are the result of playful often-intuitive improvisations with chosen colour and material. His works are concrete realities that reflect today’s urban world and affect our understanding of the social, the cultural as well as the perceptual—slipping at times into an inventive humour and poetry. In the end, like all good art, Batchelor’s work enables us to be surprised, to question, as well as to perceive and receive… energy. This essay has been one of generalities… the beauty of experiencing Batchelor’s work is to recognise specificity in action. David Thomas. Melbourne. April 2018. This project has been generously supported by the Victorian College of the Arts, Melbourne.